Have you ever had to take a stand? Pupils from around the world have gathered online to discuss the consequences of doing just that, and 14-year-old Pakistani rights activist, Malala Yousafzai, provided a focal point for the conversation. The recent shooting of Malala by a Taliban gunman was a direct result of her criticisms of the insurgents - in particular, her defence of the right of girls to education. For the young people gathered online, her plight became a clear example of how taking a stand is not always an easy option. 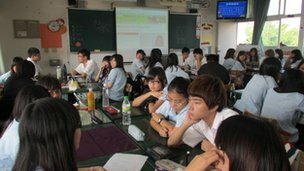 The students were debating the issue as part of International Education Week, an event celebrating global education initiatives led by the British Council. Many pupils were aware of both the incident and the fact that they were unlikely to have to take such risks themselves. "In the UK, everyone moans about how they have to go to school," commented Amelia, a student at Kingsmead School in Somerset, UK, "yet she put her life on the line so that she can get her education." Malala's story was not known to everyone. Those online in Gymnasia No.191 in Kiev, Ukraine, found the films "shocking," adding they "hadn't thought that things like these are possible in our time." The online forum, hosted by BBC World Class, gave young voices from a diverse range of countries including Mexico, Lebanon and Taiwan a chance to converse in real time, irrespective of their location. In this way, students were given a global voice for their own opinions, whilst appreciating the voices of others in different countries and cultures to their own. 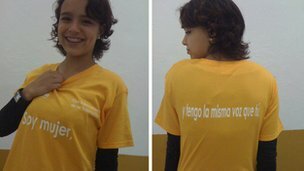 A student from Colegio Newland in Mexico models a t-shirt. The slogan reads: "I'm a woman, and I have the same voice as you." 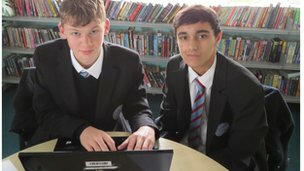 This led to pupils at Upton-by-Chester High School in the UK discussing the issue of racism with counterparts from Collegi Sagrada Familia in Barcelona, Spain - and how to deal with the situation in a school environment. Those online at Makassed Ali Bin Abi Taleb College in Beirut, Lebanon, expressed worry at the way their country might be perceived. "Lebanon is an unstable country. People in Lebanon are helpless and unsecured. And this image is stretching all over the entire Arab world," said pupil Makassed. He concluded: "Where are our rights in our country? Nobody knows!" In Kirovohrad, Ukraine, students at Taras Shevchenko Gymnasium added that they would take a stand on their mother tongue, stating: "We respect all people of all nations but we are sure that our national language should be Ukrainian". With the forum lasting two hours, a broad spread of topics were suggested as worthy of a 'stand', including gay rights, littering, and the decisions of sports referees. But there was no doubt that Malala drove the majority of comments - with students consistently describing themselves as "inspired," "amazed," and "deeply moved". By the end of the debate, it was clear that the opportunity to converse with their peers had helped those involved to consider the wider world more deeply - an attitude embodied by comments by Oliver, from William Farr CE School in Lincoln, UK. He told his global audience: "It would be better if we were less apathetic towards less free and privileged countries (such as Pakistan) and really try to empathize with how difficult their plight really is, and do something about it!" To find out more about BBC World Class online debates, visit bbc.co.uk/worldclass.